Steamed cake / puttu was my favorite in my school days. I was very lazy in eating breakfast. But this puttu, pazham , panchasara combination (steam cake with sugar and banana) helps me to finish my breakfast within minutes those days. But now everything changes. Dosa is my family favorite except my 3 year old toddler. She is a big fan of steamed cakes (puttu). She wake up from bed by asking 'puttu pazham' till today. So every day i make one piece of steamed cake (puttu) specially for her. 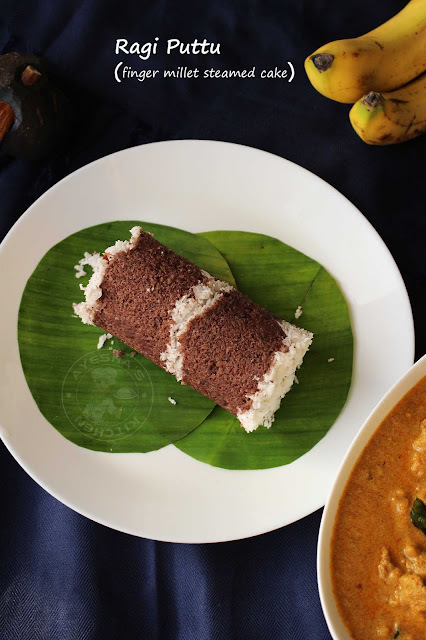 Though there are many recipes for puttu like rice powder puttu, gothambu puttu, puttu with roasted rice powder, irachi puttu, chemmeen puttu, tricolor puttu and like so. Here am posting a very healthy breakfast recipe which is very simple yet tasty. 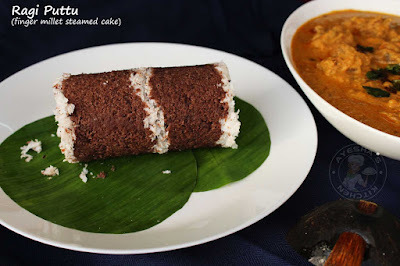 So lets move on to the recipe Ragi puttu / finger millet steamed cake. 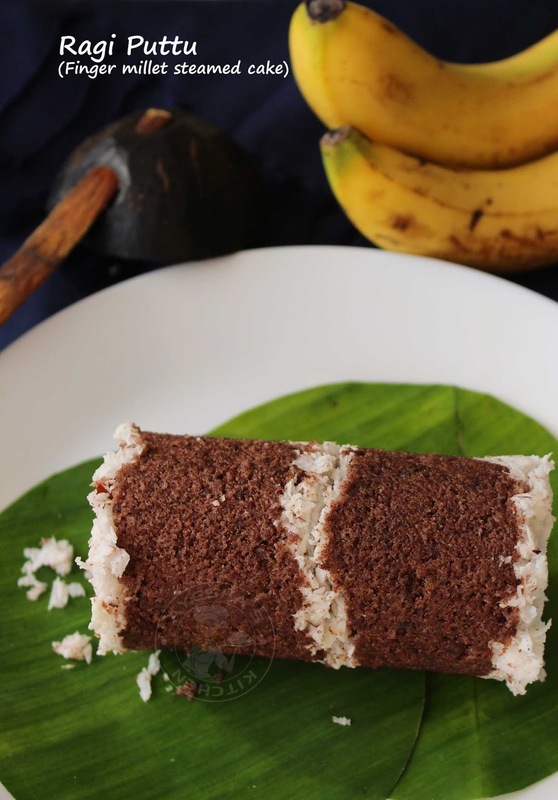 This is a must try puttu recipe for all puttu lovers or steamed cake lovers. All you need is powdered ragi (finger millet powder) and scraped coconut. Ragi, a staple in south india is a whole grain that is gluten free. As ragi is rich in fiber content, it helps with weight loss and diabetics. Nowadays rice has become the staple of our diet. But years back, whole grains like barley, brown rice and ragi play an important role in the traditional diet. However, because of its essential nutrients, this super grain managed to enter our routine diet recently. As this cereal is gluten-free, the recipes with ragi or finger millet are suitable for those who follow gluten-free recipes. Let's check some of the benefits of ragi or finger millet. Ragi helps to control diabetics, ragi plays an important role in maintaining youthful skin, Ragi boosts hemoglobin level, Ragi helps in weight loss and much more. Ragi/finger millet / nachni is one of the most nutritious foods which is easy to digest. So we must include ragi flour in our diet. Keep in mind that ragi has a very amount of fat content and high amount of fiber. It is also to be noted that we must not eat any food items in excess. Excess eating of ragi could lead to kidney stones. Some other names for ragi or finger millet are ragulu, kezhvaragu, keppai, nachni, marwa, mandika etc..You can make breakfast, lunch or dinner meal with ragi flour or finger millet. Ragi malt is given to babies. Some other recipes with ragi flour are finger millet dosa or ragi dosa, ragi ladoo, ragi idli, finger millet cookies, ragi paratha, ragi cake, ragi payasam etc.. So friends here am sharing a very simple recipe with finger millet. Hope you have loved this recipe showing how to ragi puttu. Add salt to half a cup of water and bring it to boil. Take the ragi flour (finger millet) in a large bowl and sprinkle or moist the ragi flour little by little with this salted hot water. Mix with a spoon and make a breadcrumbs consistency. (that means the puttu mixture must be wet enough to make a shape that doesn't crumble off. see the 4th pic). Now drop this to a blender and pulse it for a second or two. Do not grind or blend (be careful, very important). You will get a very fine powder without any lumps which make a perfect soft steamed cake or puttu. Now fill less than half of your puttu kudam or pressure cooker with water. Bring it to boil. Meanwhile, fill your puttu kutti or cylindrical tube - Drop the small holed disc inside this tube (do not forget). Then start layering this tube with two teaspoons of scraped coconut, followed by some ragi puttu mixture then again with scraped coconut and continue till the tube fills. Top it with its lid. When the water in the puttu kudam or pressure cooker boils, keep this puttu kutti (tube) over it and steam cook for 7 - 10 minutes or until the steam comes from the top of this tube. When you see the steam getting released from the top holes of the tube, the puttu is cooked. When done, gently remove the cylindrical tube from the puttu maker, remove the lid, then with a ladle gently press the bottom so that the steamed cake comes out through the other end. Serve hot with banana or any curry. This healthy ragi puttu tastes awesome even with sugar and a black tea.